While panning around looking for prominent and possibly interesting peaks on the way between the Dolomites and the horrors of Switzerland, the name “Ortles” caught my attention. Pronounced in an American way, it sounds like a perfect name for a large, happy, slightly stupid dog. It turns out, however, that while “Ortles” is in Italy, it is in Tyrol, which is basically still part of Austria. Everyone speaks German, and the peak is “der Ortler,” which sounds more like a sinister Nazi device than a friendly dog: “no, Herr Bond, you vill be given to der Ortler.” Anyways, it turns out to be a famous peak, the highest in the Tyrol Alps and, before World War I, the highest in the Germanic part of Europe. 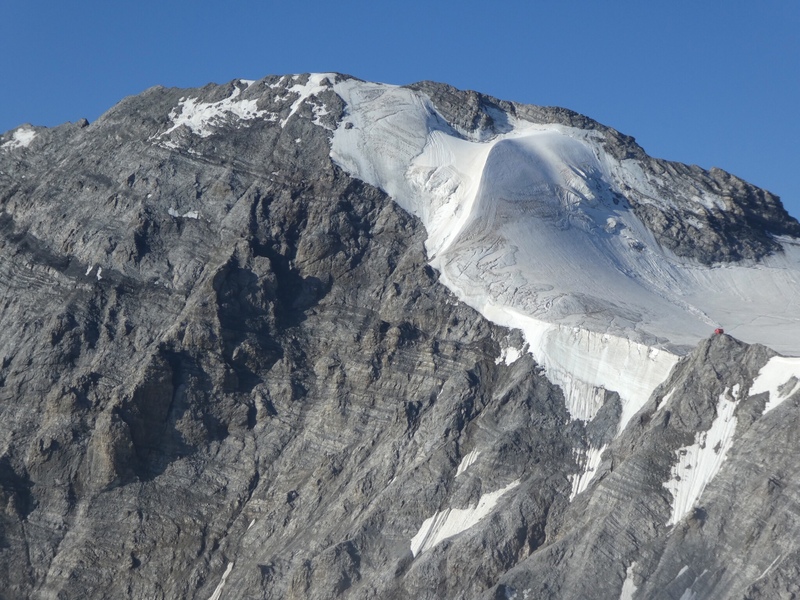 Because of this, it was first climbed relatively early, in 1804. Also, in the midst of its transfer from the Austro-Hungarian Empire to Italy, the Austrians dragged artillery to within 100m of its summit. 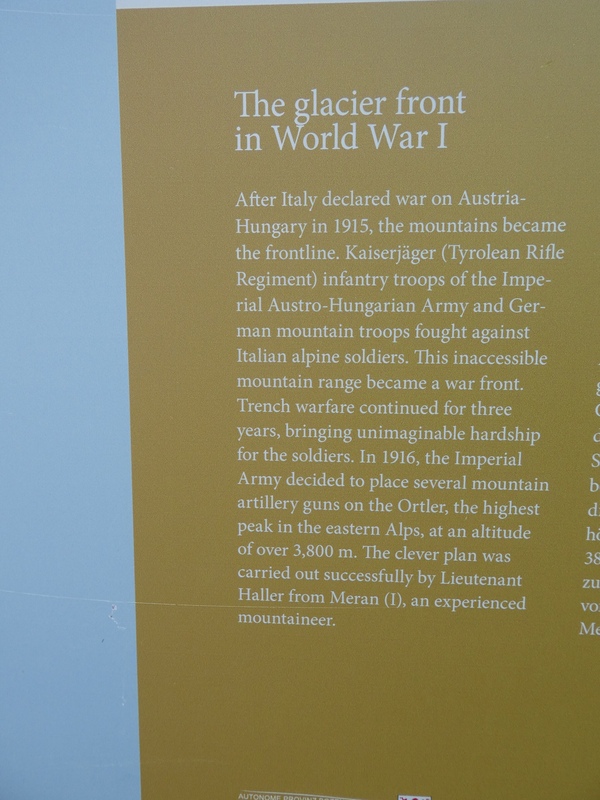 Both here and in the Dolomites, I have been struck by just how insanely hard-fought the war was between Italy and the AHE, and how little I know about it. WWI in general was glossed over in my high school history courses, with more time devoted to the Revolutionary and Civil wars, and to World War II. Most of the time we spent on it focused on the northern war between the British/French and the Germans, possibly because one side spoke English. I don’t know how the southern war’s casualties compared, but Italy and the AHE basically waged trench warfare in the Alps, turning mountains into bunkers and artillery posts. 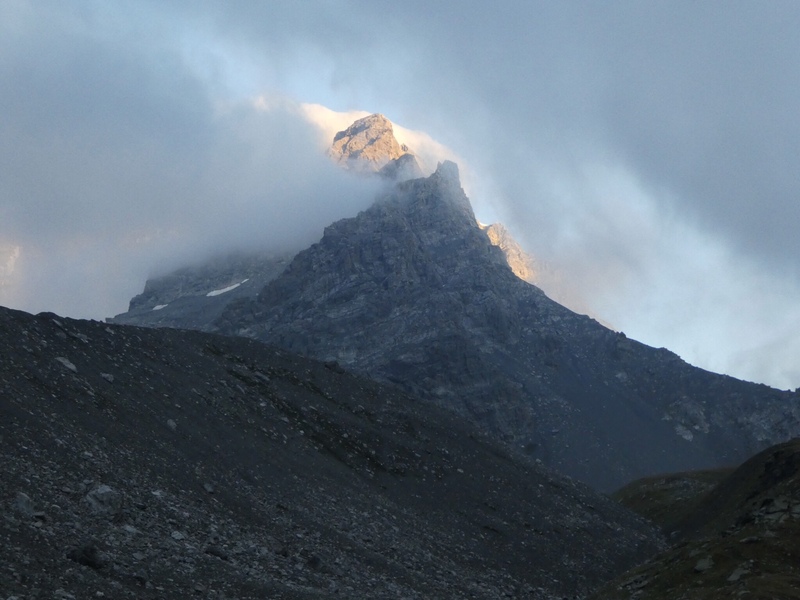 Anyways, the Ortler’s standard route follows a roundabout path from the village of Solda/Sulden, climbing far west to a break in the peak’s west ridge, then back to a high hut around 3000m. 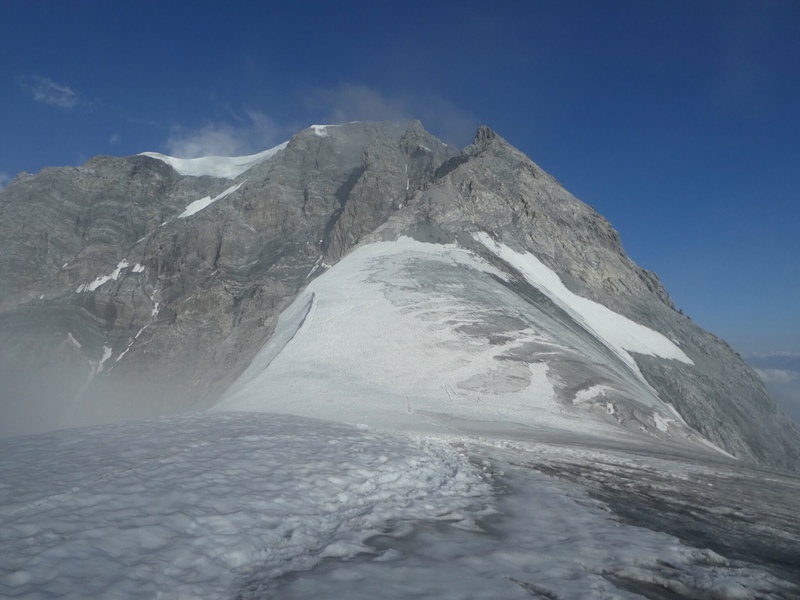 From there, it continues along a rock ridge and up a somewhat complicated glacier (which I think used to be simpler) to the summit. 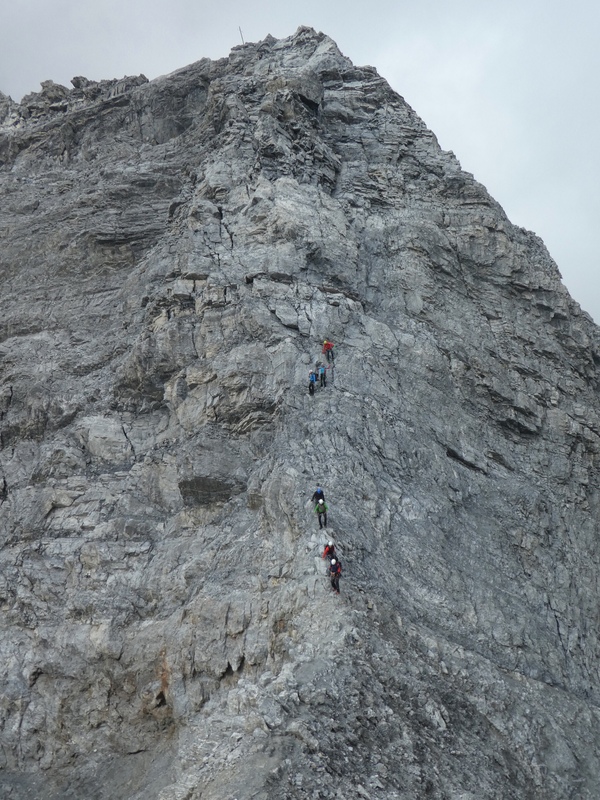 I decided to make things a bit more interesting by climbing the Hintergrat (east ridge), a more direct route with a supposed 5.6 crux. 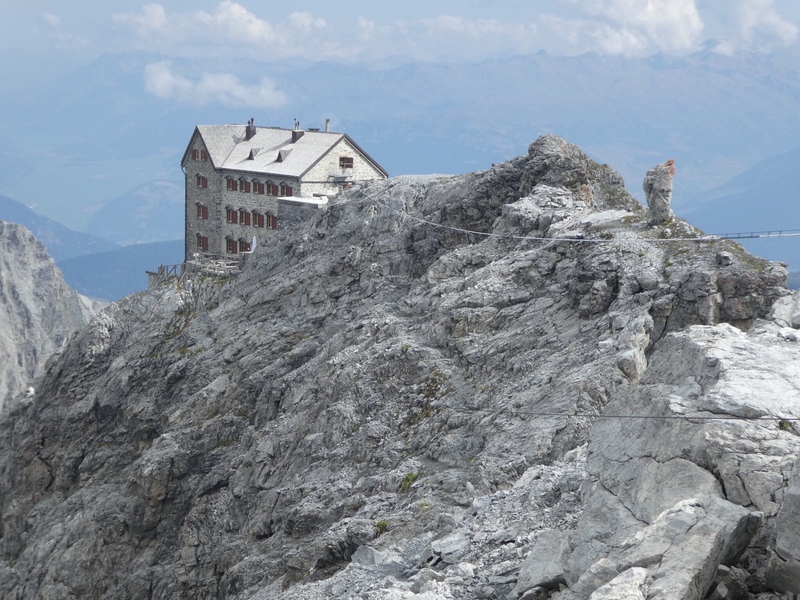 Solda looks intimidatingly Swiss, but fortunately still has a camping/parking lot above town. Conveniently, the Hintergrat approach starts right from this lot, and is well-signed, so I had no trouble finding the start in the dark around 5:15. The trail climbed efficiently up around the toe of the west ridge, to a large 3-story stone hut where people traditionally start the climb. There were a couple of people standing outside the hut, and a couple more suffering a voluntary bivouac (i.e. camping) nearby, but I did not really feel like talking to anyone, so I hiked quickly midway between. 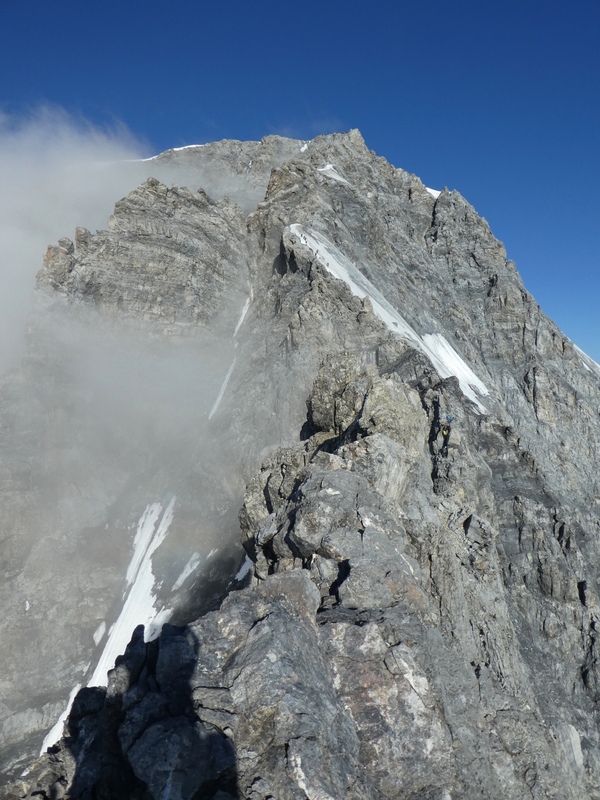 While it is about 1000m from hut to summit, much of that elevation is gained on limestone scree, which would be an absolute nightmare if there were not a nice boot-pack in most places. 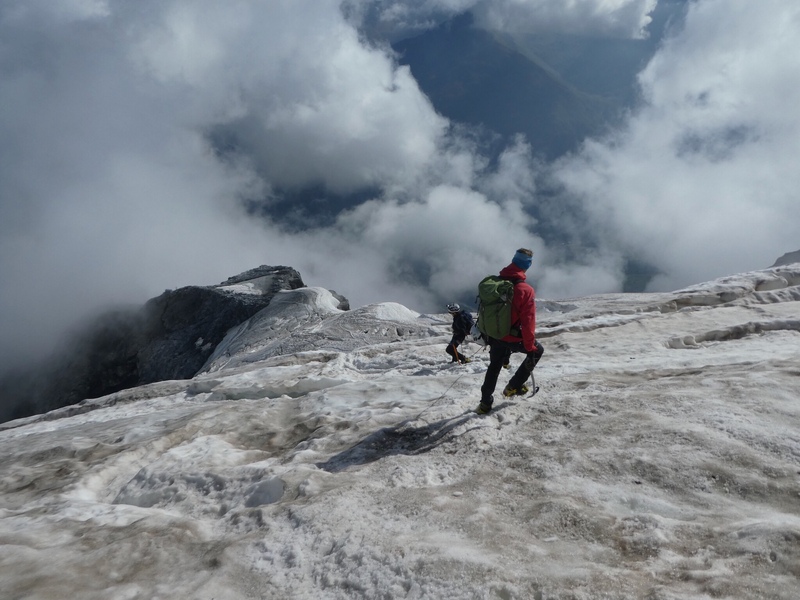 I followed the steep path, listening to a couple of very large ice-falls from an active sérac on Monte Zebu’s north face. This was clearly normal, as there was a nice fresh pile of white ice on the otherwise rubble-covered glacier below. 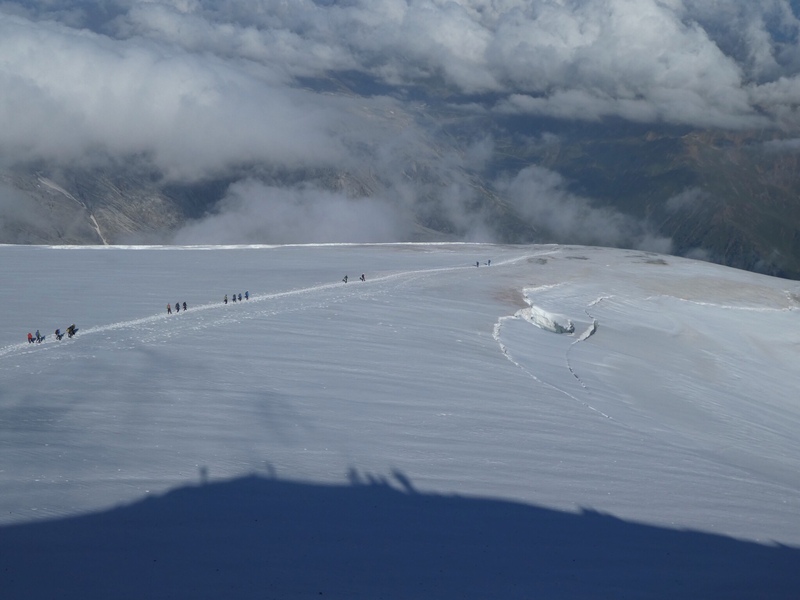 At around 3600-3700m, the climbing finally began. 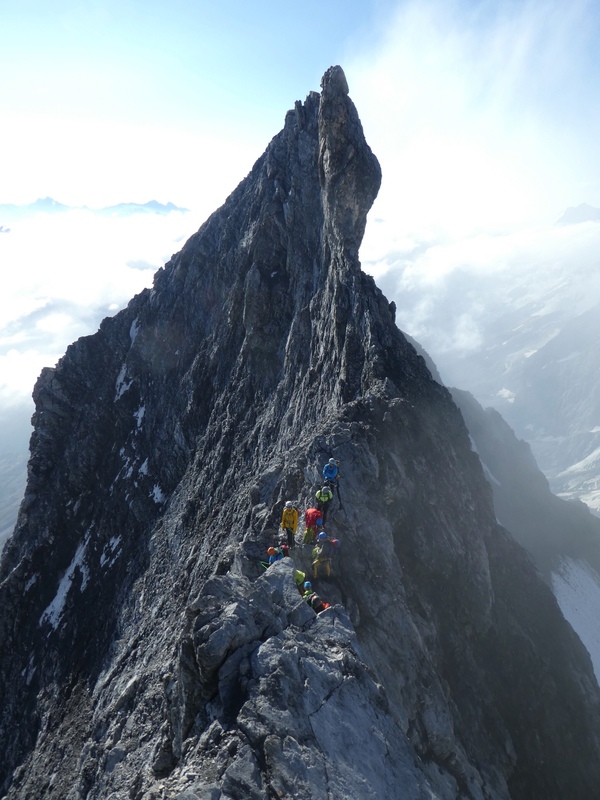 I was about to start traversing a jagged knife-edge ridge when I heard someone bypassing it to the left. I soon found the path, marked by a piton and some very polished limestone, and saw a few minutes later that my route would not have worked, as the narrow ridge ends in an overhang. A short distance on, I met two parties piled up below the crux, a 10-foot step with some polished holds and a chain on top. I probably could have climbed it without grabbing the chain in its pre-polished state, but was happy to have the aid given current conditions. Above this, I steadily threaded my way through parties doing various things with ropes. The terrain was mostly class 3-4, with maybe a harder move here or there, it was warm enough to climb without gloves, and I generally had a good time cruising to the summit. There were already maybe 20 people on top when I got there around 8:30, most or all having climbed the standard route from the other side. I found a spot to eat a sandwich, trying to avoid being stepped on by crampons. 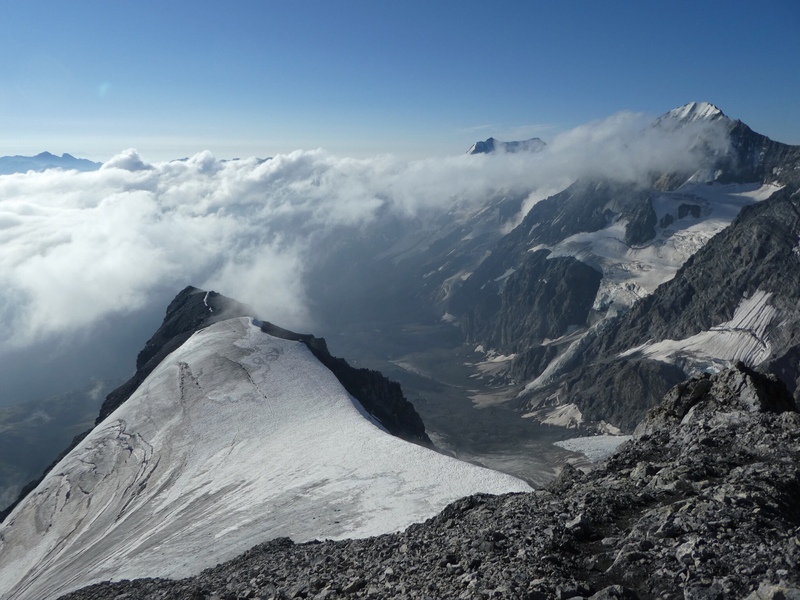 A layer of clouds hid many lesser peaks, but there were fine views of Monte Zebu and the Konig-Spitze (Grand Zebu) nearby, and some other high peaks I could not identify farther away. The summit was only getting more crowded, so I started down the well-beaten path through the glacier. Fortunately I did not have to do any route-finding of my own, because the way down was actually somewhat complicated, with a ladder over a crevasse, several metal posts that guides were using to belay clients, and a few places where people had put a leg through a weak snow bridge. 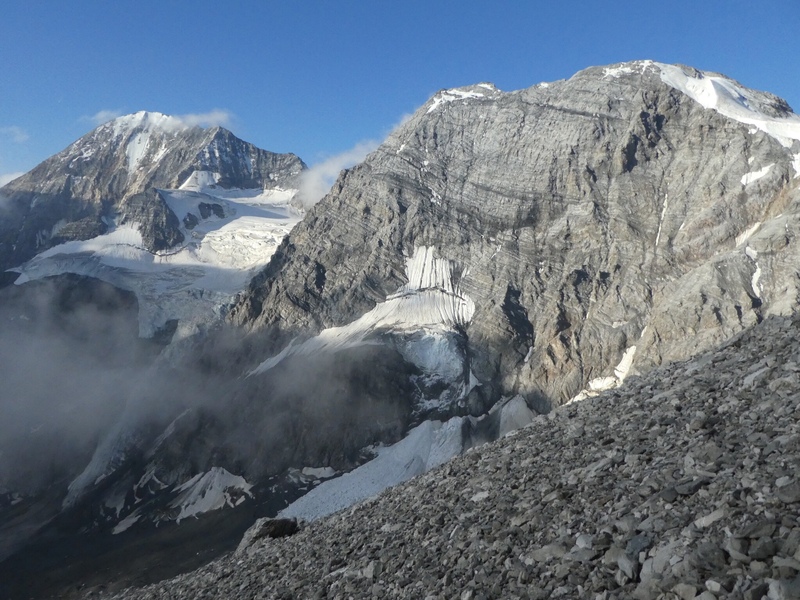 Finally I reached some rock near a bivouac shelter, and hoped that I was done with the day’s glacier-work. Unfortunately, I only had a couple hundred yards’ reprieve before getting back on the glacier for another stretch. This probably used to be a continuous glacier climb. Back on rock for good, I traversed some metal steps, then followed chains and crowds down the rock ridge to another large 3-story hut. 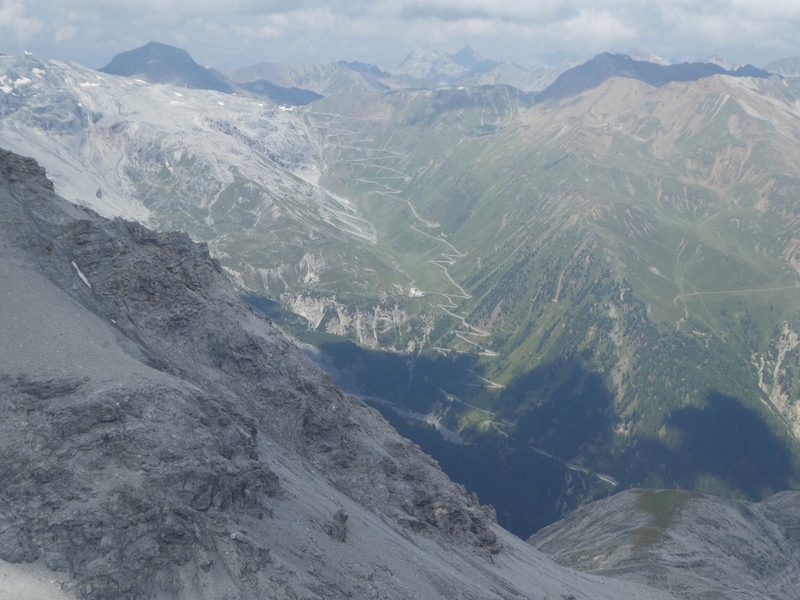 I hadn’t paid much attention to the route below this, and did not realize just how far out on the ridge it goes before doubling back to descend toward Solda. I jogged some of the path, but I was in no hurry, and did not feel like really trying for speed. As a result, I finally made it back to the upper end of town around lunch, taking longer for the descent than the ascent. It might have been quicker to reverse the Hintergrat, but this way was slightly easier, and it also gave me a feel for just how large Ortles (bad dog!) is. 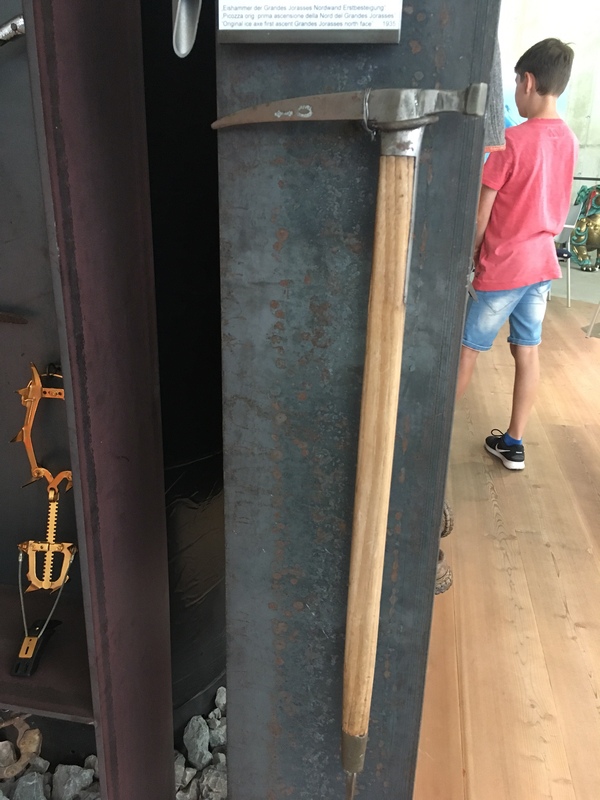 To kill some time afterwards, I checked out the satellite Messner Mountain Museum in town. 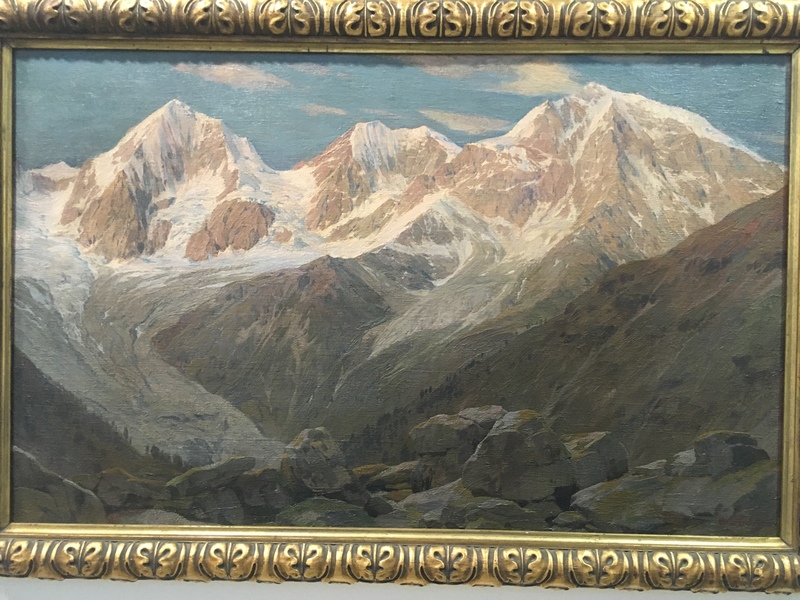 While it was not really worth the €8 entry fee, it still had some interesting stuff, including paintings of the Ortler and Aosta valleys showing their glaciers 100 years ago, and some historic ice gear. 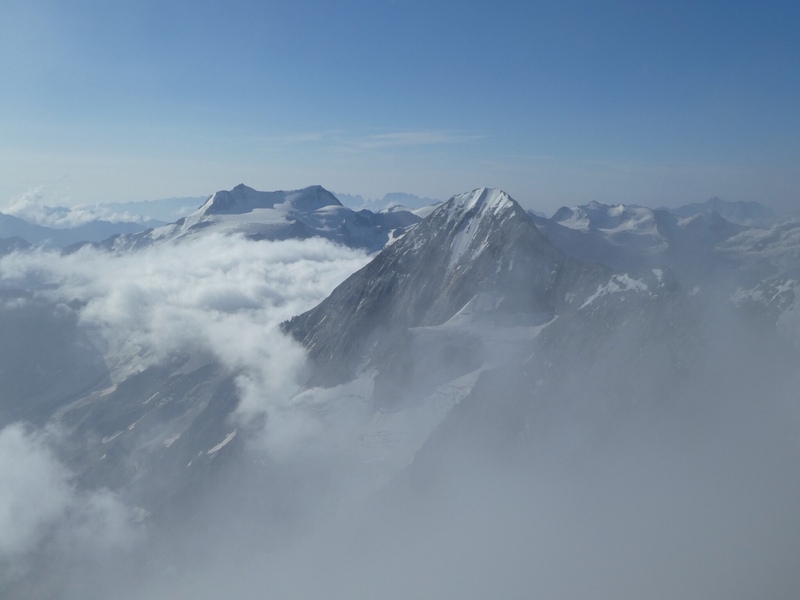 Having now seen some of the famous Alpine north faces, and the primitive ice axes, crampons, and protection used to tackle them in the 1930s, puts my meager efforts in perspective. Amazing story and another amazing climb. Your blogs are great to read. I enjoy your photography as well. Hi Sean, I have been enjoying your European journey very much. Strictly from a photo perspective, this is one of my favorites. Mike (the plumber) from work week. Thanks! I’ve been enjoying my Alpine adventure quite a bit myself; too bad I only have a few more weeks.